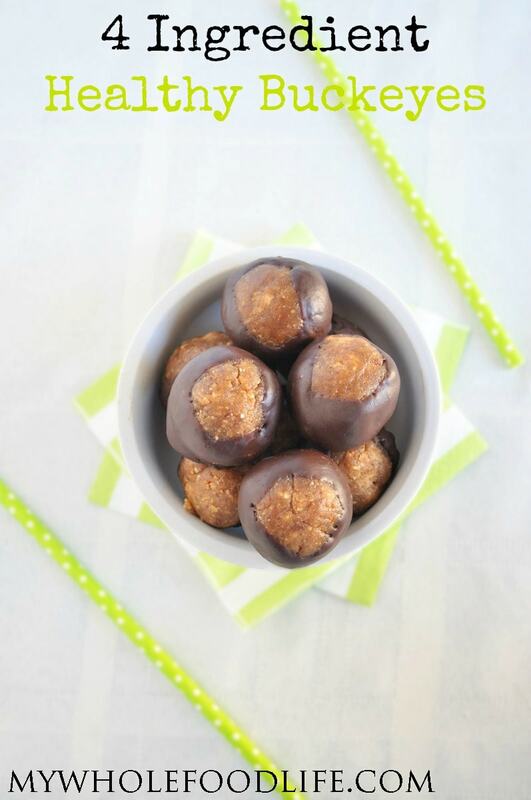 4 Ingredient Healthy Buckeyes. Do you know what buckeyes are? I made some healthy buckeyes for you! Buckeyes are a dessert that originates in Ohio. According to Wikipedia, the buckeye candy resembles the buckeye tree, which is the state tree in Ohio. I am not from Ohio and I have only driven through it a couple times. However, I have had buckeye candy and it’s delicious! So I had to create a healthier version. Basically, it’s a peanut butter fudge which is covered almost entirely in chocolate. You can’t really go wrong when you think about peanut butter and fudge right? Well traditional buckeyes are made from powdered sugar and other processed ingredients. Not mine! All you need is 4 ingredients to make my version. If you like recipes with minimal ingredients, you may also like this post with 20 healthy dessert recipes with 5 ingredients or less. You guys! This recipe is seriously easy to make! The balls themselves have no added sugar. The chocolate chips contain a little. Not much when you think of how thin the layer of chocolate around the ball is. 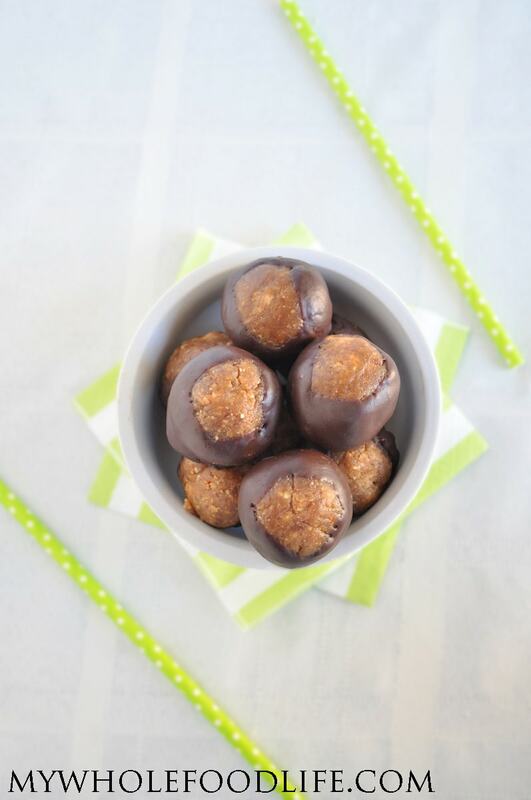 These healthy buckeyes are vegan, gluten free and grain free. I hope you enjoy them. As you read this, I am on my way to Florida for my family’s first real vacation together ever. My husband and I never even got a honeymoon, so this trip is huge for us! We are super excited to be able to take the kids to Disney. Why am I telling you this? Just to let you know that it may take me a little longer than usual to answer any questions/comments you may have. During the time that I am gone, I do have several guest posts lined up, so stay tuned. In the meantime, I plan to be posting a little about our trip on Instagram. Feel free to follow along. Onto the recipe. Just like the traditional buckeyes, but made healthier. Only 4 ingredients! Drain the dates and rinse. Place them in a food processor and blend until you get a paste. You will probably need to scrape the sides down several times. Once you have a date paste, add in the peanut butter and continue to blend until both ingredients are incorporated. You can add a little salt at this time if you like. I did not add any. Roll the mixture into balls and place on a lined baking sheet . Stick a toothpick into each ball. While the balls are in the freezer, make the chocolate. To melt the chocolate use a double boiler. Bring a saucepan to a boil. Place a glass bowl on top of the saucepan. Add the chocolate chips and almond milk to the glass bowl . Gently melt the chocolate and stir often. Once all the chocolate is melted, hold the toothpick and roll each ball into the chocolate. Leave a little bit of peanut butter showing through. Once all the balls are rolled in the chocolate, set them back on the lined baking sheet and stick in the fridge to set. It should not take long. Once the chocolate has set, you can store these in the fridge or freezer. They should keep a couple weeks in the fridge and several months in the freezer. Enjoy! oh I was so surprised to see date paste in this!!! Love this healthy recipe. I've had Buckeyes in the past but these sound so good I have to remember this when doing my Christmas candy! Have a great time in Florida! Thank you!! I love how versatile dates are. You're welcome Joylene! So glad you liked them! These sound great! I love buckeyes, but only eat them once a year at Christmas time since my stepdad's family all went to Ohio State. Will pin for later! And have a great time on your vacation!! I can't believe it's your first one! Enjoy! We took our kids to Disney World a year ago...we all loved it! I look forward to following your pics on Instagram! Thanks LeAnn! Thanks for pinning too! My husband went to Ohio State. He will be so pleased to see this in the rotation at home. Thank you!! Have a great trip! Yum! I'm making these tomorrow! Yum! It's like a healthy version of a peanut butter cup. Thank you! I have never tried a buckeye before! Here in Australia.. I have never even seen them! Definitely a recipe that I need to try though - they look delicious and perfect for a healthy snack! Melissa, Am I supposed to peal the skin off? Is that the purpose of soaking the dates? No. It just softens them into a caramel so they blend evenly. Love these! They are rich and delicious! I was surprised that my fiance loved these ones just as much as the original. YUM! Oh yay! Happy you liked them! Did you use natural peanut butter or pub like Jiff and Skippy? Thanks! I used natural peanut butter. It was not the kind that separates though. These are seriously delicious! I've made buckeyes using chickpeas before but these are SO much better. Thank you for sharing! Thanks Julie! So glad you liked them! I have made this recipe multiple times & it is always a hit when I share it with others. One improvement is to avoid adding almond milk to the chocolate chips. Even one drop of liquid in chocolate will cause it to seize & it will never melt completely. The end result will be a chocolate mess. Sorry you have an issue with the milk. Are you adding cold milk to room temp chocolate? Could be why. I always keep my chips in the fridge so both are cold when they are mixed. I have always added some paraffin wax when I melt the chocolate chips when I dip pb balls. It makes the chocolate smoother when melted and harder/shinier when cooled. Where do you get the wax? Do you melt it into the same pot as the chocolate? I just made these and had the same issue with the chocolate seizing and it was a double batch, so that's a lot of waste. Thankfully I had more on hand so I could have a do-over for melting the chocolate and just didn't add any almond milk. That was always an issue when I was younger and made lots of fudge and things like that. I wondered if the almond milk would be different, but it wasn't. The finished product was really tasty and should curb my husband's sweet tooth. I think next time I might just put them in mini-cupcake liners after completely dunking in chocolate. I've never heard of buckeyes before, but these work just as well as peanut butter cups, which I know really well! No worries Melissa. I love these! Made them again last night and just dropped the peanut butter/fig balls into the melted chips and didn't worry about the 'buckeye' look. Simple and still looked really nice. These things are amazingly yummy! Did you use a certain type of chip? And why is the almond milk added? Will these melt at room temperature? I am a bit nervous to try this recipe. The last time I tried gluten free recipes, (caramel dip, hummus...) I was very disappointed, and down some major cash, as the special ingredients cost a lot. I used Enjoy Life chips for mine. I add the almond milk because it made it easy to swirl the chocolate around each ball. They will get soft at room temp for too long. I promise they are very good though! i made these today and they are a big hit. I was never a fan of dates until I started making your recipes. I have made a few of your recipes including your ice cream recipes and they have all been a big hit in my non vegan family. That is so great Brenda! I am glad you liked them. These are so good!!! Thank you so much for sharing this recipe. I'll definitely be making buckeyes more than once a year now that I have a healthy version that's just as tasty! You're welcome Emily! So glad you liked them! Can I blend these in my Vitamix? It may be a little too thick for the Vitamix. If you try, I would love to know how they turn out. Pingback: Buckeyes | Eat. Drink. Savor. Repeat. Has anyone tried subbing sunbutter for this one? My son is allergic to all nuts.